I like m&m’s, never was a huge fan of the peanut variety but these did give me a little extra staying power getting through the third hour (what we called the power hour) of Hebrew school so for that I found them useful. I think there are a few different similar candies but I found the Family Pantry version on this particular day roaming Family Dollar. Ethan is a big fan of Peanut m&m’s so I’d rely on his expertise in this evaluation. These had a nice shine and vibrant color. They also feature the pleasant trademark lowercase “m” on each piece. 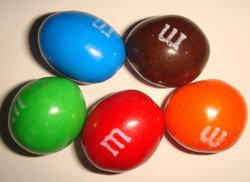 The chocolate is pretty good for milk chocolate, it’s a very reliable chocolate that seems to be consistent with every other bag of m&m’s I’ve ever had. Ethan felt the peanut flavor takes over a little but because they’re so good. These had similar colors but had a duller sheen. The shell was harder and seemed to crumble which revealed a weird “mocolate” that lacked a real chocolate flavor. The peanuts were okay as far as flavor but seemed harder than the m&m peanuts. 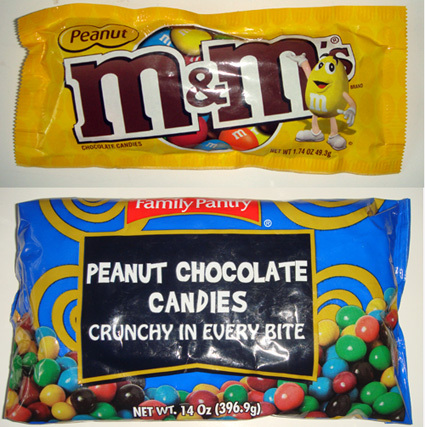 We have to go with m&m’s for the better tasting chocolate and softer peanuts. The Family Pantry version was just okay but I think if you’re going to buy one of these you might enjoy the better quality chocolate because I question how the Family Pantry makes their chocolate to not really taste like chocolate. Peanut M&M’s–the winner and still champ-peen! M&M’s of course! Looks matter, just like I REFUSE to eat those brown M&M’s! I swear the blue ones taste the best! @Sophia, OM-Gosh the brown ones totally rule over the blue! Don’t the blue ones give you cancer? I love LOVEEEE peanut M&Ms it´s been years since the last time I has a regular M&M, and even tho sometimes I´ve found some stale peanuts they´re my favorites. M&M’s hands down 🙂 Yum in the tum! 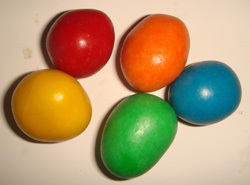 i miss almond m&ms…do they even make them anymore?